Handel Street Projects is pleased to announce South Face, an exhibition of new works by American/British artist Jeff McMillan. The position of painting as the ultimate form in visual art, with its heavy burden of representation and abstraction, doesn’t make it an easy art form to approach today. 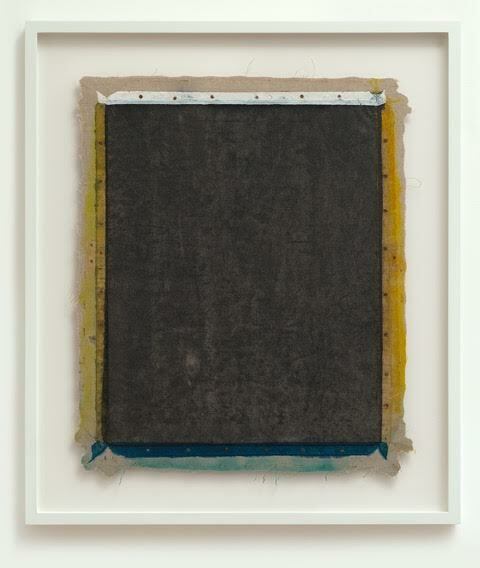 For McMillan, an abiding interest in the physical essence of paint and its attendant processes of making, have led to ever more straightforward and reductive paintings that are not reliant on image. 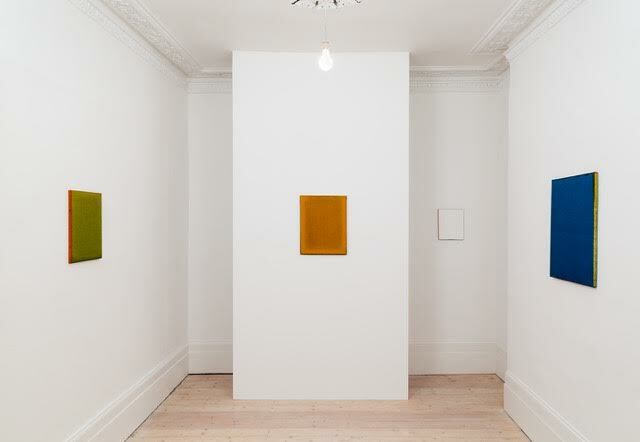 His paintings are at times reminiscent of minimalist works, and often are not just two dimensional, but hover between painting and sculpture. At the same time their manufacture is very low tech, often involving found materials and simple processes. 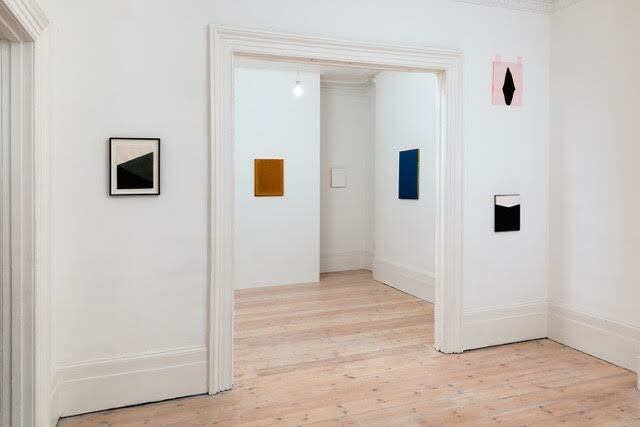 This exhibition consists of two bodies of work: paintings on canvas and works on paper. They are probably both affected by the artist’s recent move to a new studio with better light and outside space, contributing to more porous works that experiment with luminosity and the affects of time and weather. They separately encompass the artist’s previous interests in working with found paintings and dipping them in oil paint where the duality of destruction/creation transforms a pictorial image into an object. Here, found sheets of lined or graph paper, with traces of writing, are dipped in black or white gloss paint. 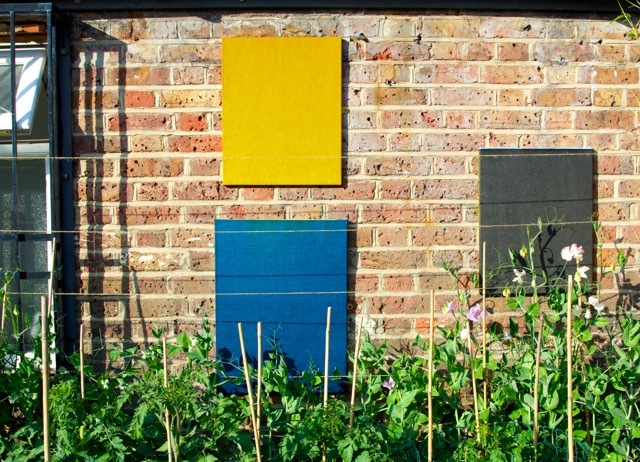 This creates simple geometrical compositions, overlaying previous content with a veil of paint. With the found canvases there is no longer painted imagery, which he employed in previous works: they have been reversed and re-stretched to reveal the backs, and then paint or inks are applied. Some are then hung outside and left exposed to the elements, their brightness eroded by sun and rain, then harvested only when they are ‘ready’. The effect is melancholic. These works capture the passing of time and the involvement of chance, but also reference some heroic attempts to reveal what constitutes painting itself. Jeff McMillan was born in the US and has lived and worked in London since 1998. Previous one-person exhibitions include at PEER, London, Christine Koenig, Vienna, and La Culpable, Lima, Peru. Group exhibitions include at Ingleby Gallery, Edinburgh, Magazin4 Bregenzer Kunstverein, Bregenz, Lisson Gallery, London, and John Moores Painting Prize in Liverpool on three occasions. 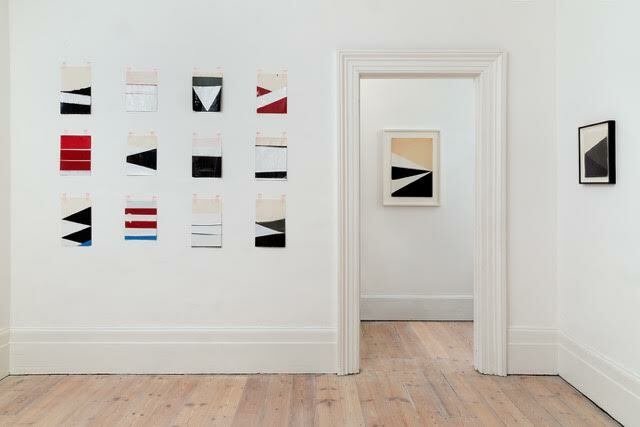 McMillan has also curated several exhibitions including British Folk Art at Tate Britain in 2014 (co-curator) and most recently the abstract drawing exhibition Tell it Slant, at Frith Street Gallery from 12 February – 29 April, 2016.